World renowned weird fiction scholar and editor S. T. Joshi has assembled new stories based on the theme of dreams and nightmares from some of the top authors in weird fiction today. Including new stories by Ramsey Campbell, John Shirley, Caitlin R. Kiernan, Reggie Oliver, Simon Strantzas, Gemma Files, W. H. Pugmire and many more featuring stunning cover artwork by Samuel Araya, Nightmare's Realm is slated to be one of the bestselling Dark Regions Press anthologies yet. 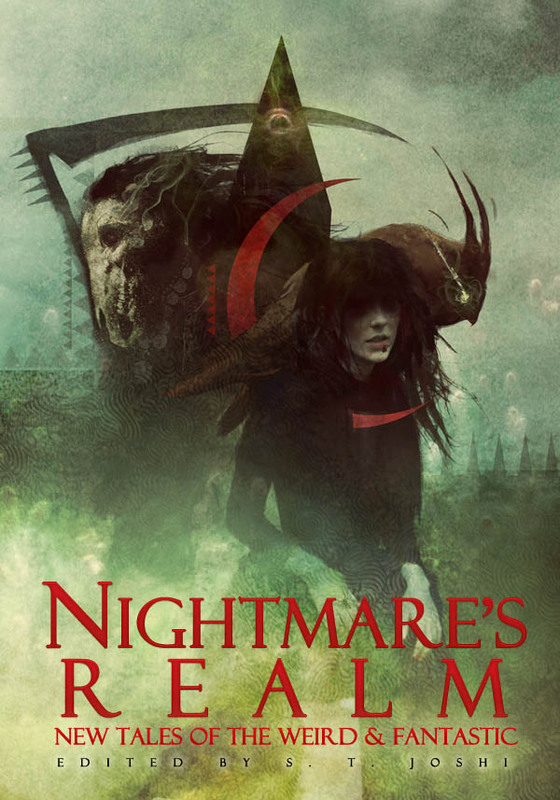 Those looking to read Nightmare's Realm: New Tales of the Weird & Fantastic this year are in for a treat: anyone who supports the production of the book by preordering a deluxe hardcover edition on DarkRegions.com starting November 22nd will get instant access to download the ebook edition! Ebooks and trade paperbacks of Nightmare's Realm will not be released separately until Q1 2017. Dreams and nightmares often give us glimpses into our true character; they can reveal our deepest anxieties and our most ambitious aspirations. Weird fiction has a rich history with dreamlike stories and nightmares that cross boundaries between the real and imaginary. Even H. P. Lovecraft endured many bizarre dreams from the early days of his youth that he then used as inspiration for some of his fiction and poetry. Now world-renowned weird fiction scholar and editor S. T. Joshi has assembled a new set of nightmares from some of the strongest minds in weird fiction today. Nightmare's Realm Table of Contents Introduction by S. T. Joshi Prologue: To a Dreamer by H. P. Lovecraft The Dreamed by Ramsey Campbell A Predicament by Darrell Schweitzer Kafkaesque by Jason V Brock Beneath the Veil by David Barker Dreams Downstream by John Shirley Death-Dreaming by Nancy Kilpatrick Cast Lots by Richard Gavin The Wake by Steve Rasnic Tem Dead Letter Office by Caitlín R. Kiernan The Art of Memory by Donald Tyson What You Do Not Bring Forth by John Langan The Barrier Between by W. H. Pugmire Sleep Hygiene by Gemma Files Purging Mom by Jonathan Thomas The Fifth Stone by Simon Strantzas In the City of Sharp Edges by Stephen Woodworth An Actor’s Nightmare by Reggie Oliver Epilogue: Dream-Land by Edgar Allan Poe Make sure to join Dark Regions Press on DarkRegions.com on Tuesday, November 22nd 2016 to secure your copy of Nightmare's Realm: New Tales of the Weird & Fantastic Edited by S. T. Joshi!